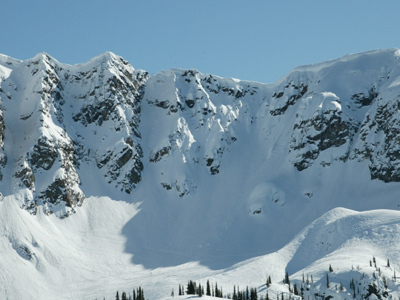 Revelstoke Mountain Resort boasts North America's biggest vertical drop, gondy service to the midstation, a high-speed quad to the top, and yes, powder too. Trees, alpine bowls and thigh burning groomers, the inbounds skiing at RMR will keep you satisfied. But if you want to sample the slackcountry goods, the resort has them too. You can grab a locally roasted coffee and a freshly baked pain au chocolat at La Baguette at the base and be ski touring 6,000 ft above the cafe´ in less than a half an hour. Very handy! We included a few of the classics here for you. Note that many of these lines are “consequential” – a nice way of saying that your actions can get you, and those below you, into significant hot water. Consider tagging along with someone who has skied these lines before and always approach with caution and knowledge of avy conditions. All routes listed here provided by Conor Hurley of Stoke Roasted. If we have missed anything please let us know? The Door Chutes offer some steep turns just outside the ski area boundary. Follow the bootpack to the sub-peak, you’ll notice a saddle between the prominence that marks the ski area boundary and the summit of Mt. Mackenzie, there lie the Door Chutes. Be advised the prominence is known to the ski patrol as “BFD” or Big F#$king Drop, so don’t go there to scope your line, a better option would be to take a run through Greeley Bowl and have a look at the run you want to ski. Numbered one to four, from the prominence to the intersection of Mt. Mackenzie’s face, (#3 requires a rappel or other means of intense exploration) the Door chutes range from grandiose to skinny. Be forewarned, people have taken rides in all of these chutes, some more severe than others. 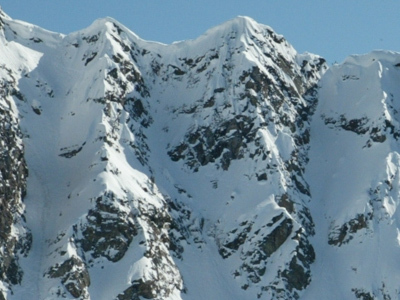 The chutes are subject to severe wind loading from the south and often have big cornices at their entrances. They are not controlled and nor are they patrolled, so you should be prepared with knowledge of the snow and self-rescue. Lastly, all of these chutes could affect skiers below, so heads up and don’t drop something on someone else. 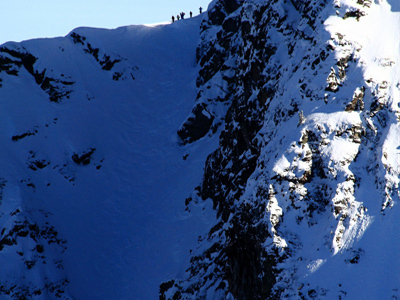 This route often requires a 2-3 metre drop to enter it followed by some steep chute skiing. This route is the skinniest of them all—drop in and get jiggy with it. If you are going here, you know what you’re doing, if not, look elsewhere for something fun to do. This is the biggest and widest of them all. Often times a large cornice looms over the top of it. Rap in, drop in or slide in, depending upon the conditions; it’s a straight shot to Greeley Bowl from there. 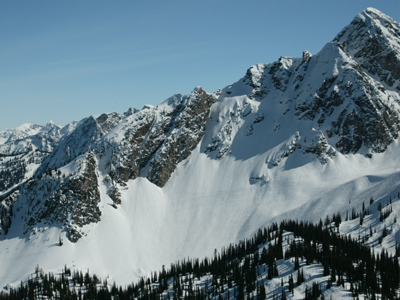 Stand on top of a summit and grab a view of the Selkirks and Monashees. From the sub-peak, look just north of east and you will see the summit. Follow the ridge past the Door Chutes and climb to the summit. You’ve got options, and the route to the summit changes from day to day depending upon the winds. 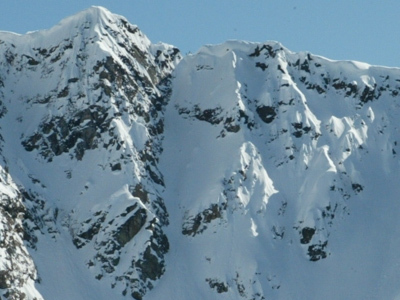 This is the prominent chute on the looker’s left of Mt. Mackenzie’s summit which stares directly at you when you stand on the sub-peak. Getting there is awesome! Not only do you get to stand on a summit, but you also get fantastic views of Rogers Pass and get to test your skiing skills by dropping into Mt Mackenzie’s East face. From the summit, drop in and trend left, hugging the edge of the face, but be aware, there is really big air on the other side. The entrance of Brown Shorts lies approximately 50 m below, at the intersection of the face and a ridge that trends west. People often mistake a higher depression on the ridge of the face for the entrance to the chute and spend time standing on a cornice overhanging a large cliff; don’t be one of them, and continue down to an obvious col.
Again, this chute is the real deal, both getting to it and the chute itself will put you into consequential ski terrain, don’t go there unless you know what you are doing. People have been caught in avalanches here. Brown Shorts also threatens the terrain below and from the top you can’t see if there are people below you. 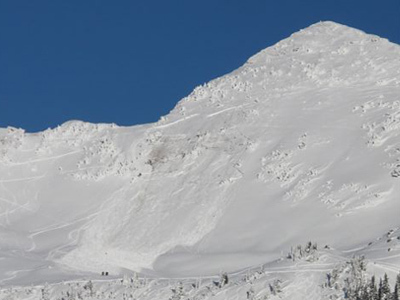 Cutting cornices or otherwise controlling avalanche hazard could potentially bury someone below. RMR Avalanche forecaster Troy Leahy skied this one on his birthday the first year of the expanded resort, subsequently, the gully has taken on the moniker, The Birthday Chute. Ski down to Greeley Lake at the bottom of Greeley Bowl. 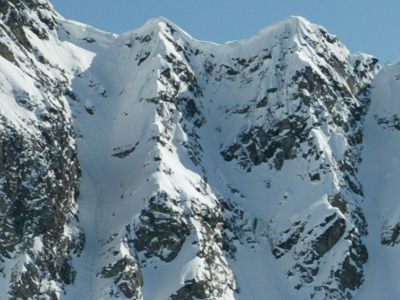 Do not take a high traverse across the fan to the skier’s right of the Brown Shorts chute. Traversing is not cool, it ruins the run out from runs above and you expose yourself to skier hazard above—Big avalanches have been triggered by skiers entering the terrain above the fan (Size 2.5 that ran from the ridge top to the ski area boundary); don’t be lazy, ski to the lake. From Greeley Lake an obvious chute dumps it load just to the gazers’ right of a treed prominence on the ridge. With you skins on, contour from the lake through a talus slope at the bottom of the spur to a glade where gaining elevation looks reasonable, you will be exposed to hazard from the slopes above. After gaining the initial bench, the terrain becomes more convoluted. A series of open benches separated by steep treed slopes will take you to the crest of the ridge. Be aware this terrain is subject to wind effect and also often harbors surface hoar. Once you’ve gained the second major bench, continue up to where the ridge steepens again, at the intersection of the two slopes, you will find the entrance to the Birthday Chute. 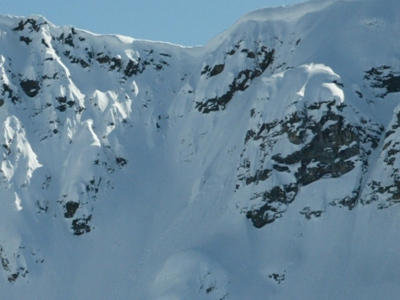 This can be a great quick hit from the ski area, or it can be an avalanche and a ski down a firm be surface. If there has been a lot of wind and a fresh dump, you can probably bet on the latter scenario.